Today’s episode, written up by our own David Lichty, is from season 4, episode 7: Reunion. Time for some Klingon intrigue. Well…it’s a soap opera! The Klingon Empire faces civil war as two rival leaders vie for the position of Head of the Klingon High Council. The current leader, aware that he is being poisoned, calls upon Captain Picard (who has been deeply involved in Klingon politics before) to run the transition and find his soon-to-be-killer. One of the potential assassins has had bitter dealings with Enterprise crew before; the other one, well, he just looks crazy. K’Ehleyr, a half Klingon/half human ambassador with whom Worf had a fling, has come aboard to help with the investigation, with her young son in tow. She’s killed for snooping around, passing her discovery to Worf before she dies. Worf goes after the bad guy, killing one of the two contenders for the leadership of the entire Klingon Empire …for messing with his woman. Worf is left with a son. That’s a lot of plot. Interested? Well, just having that to go on, I wouldn’t be. It sounds like a silly mess. Why did I choose it then? It took Worf the better part of three seasons to get past only delivering lines that should be followed with a forceful, “I am KLINGON!” I found him to be pretty one-dimensional for a while, so I really didn’t favor episodes filled with even more characters like him who communicated almost entirely in guttural formalities. These kinds of stories tend to place the perfunctory over the real, and honoring culture over doing what is right. The thing is, many people really do like these, yet I am surprised to find myself covering the sole episode in this series which focuses directly on the Klingon Culture. Structurally, this episode is a political melodrama, but it also pushes some of the characters out of their self-presentations; and they behave more like real people than usual. 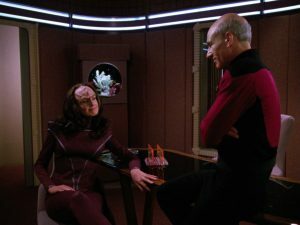 I picked this episode because it is so full of humanity in the moments that it works even against its Klingon Episode type. Those are generally appreciated because of what was done in developing the Klingon mythos, or how a given episode changed the series. In this one, things matter because they matter specifically to the people on screen, and that made them matter to me. Upon learning of the leader’s poisoning, Worf is not offended as a Klingon; but more surprised, just as an investigator helping Picard. K’Ehleyr and Worf relent when they get past the necessary parts of their talks. They drop their guards. He shows vulnerability with her just as much as she does with him. When she dies, Worf does a Klingon yell, established in an earlier episode as a “the Klingon way” thing. Here he does it out of real loss rather than mere honor. Head of the writing team at the time, Michael Piller, hated it, and told them not to do it. He only relented on shooting it with the idea that he’d cut it out in editing, but then he saw it, and he didn’t cut it. Worf does the yell like he needs to, rather than has to. It is pain, not performance, and Piller liked the character stuff. Worf murders. He’s not defending anyone, and he’s not fulfilling a Klingon honor requirement. He acts out of the hot desire for vengeance. This is bold and unusual, both for this character, and for the series in general. When Picard reprimands Worf, he means it. Then there is Suzie Plakson, whose performance just drips with feet-firmly-on-the-ground credibility. When she dismisses some of the Klingon political dirty-dealing as “The usual excuses. Tradition, duty, honor,” she is not merely positioning her character as an outsider. She says it like someone who finds that stuff trite, but not astonishingly trite, as if she’d never had to say it before. Her character, K’Ehlyr, was going to die in all drafts of the script, and the writers stood by that despite a well-argued protest from a fan group that had learned of the intent. To them she represented a rarity: a strong, self-possessed, capable woman who was also unusually likable, especially for that kind of character on television at that time. That’s all Plakson. What are the divine themes? This particular Klingon episode tears the veil. Right after Jesus of Nazareth died, a thick, heavy curtain, designed to wall off the holiest part of the temple where the Jews worshipped God, ripped down the middle, seemingly on its own. This symbolized the end of the heavily ritualistic way man had been required to approach God. Thenceforth, it would always be more personal, more direct. It could be called a relationship after that, one not limited to a mere technical or legal kind of accord. Christ had come and made a way too God. Because Reunion is interested in being honest, real, human, and genuine, you could watch this as your first Klingon episode and generally follow it well. The weight of matters is given to us by the characters, not the story’s background. Reunion puts humanity over culture, reality over ritual, the genuine over the perfunctory, and it tears this veil in an episode steeped in culture and ritual. The culture is a reality to be dealt with, not a way of life to be shown reverence. Worf won’t claim his son because of an official shaming he has endured. 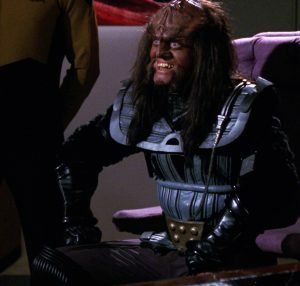 The conversations about this don’t fall into standard conservative Klingon vs. liberal Klingon didactics; he worries that his son would also be treated shamefully if he should want to live as a Klingon. K’Ehleyr gets it, a real concern about how this cultural reality, whether approved of or not, could have a palpable impact on their son, and they discuss it on those terms, rather than on whether that should or should not be the cultural mandate. Picard even stands up to the power-seeking Klingons by using arcane details of their cultural requirements against them rather than automatically deferring to their current ways. He does the same with Worf, who knows that one of the power parties has a traitor in his family history. WORF: Duras must not be allowed to lead the council…His father betrayed my people to the Romulans. Duras is a traitor. PICARD: Klingon tradition may hold the son responsible for his father’s sin. I cannot, Worf. Treason was his father’s crime. Duras’ crime was to lay that blame on your father. I will not forget that. All of this focus on genuineness ties to an important thing about Jesus: Presence. Jesus was here. God on Earth was here, really here. He not only died, but He lived. Jesus was here. God on Earth was here, really here. He not only died, but He lived. In Reunion, Worf murders. He breaks two codes he follows religiously, and acts out of a righteous anger. He’s being real. Likewise, Jesus tossed tables in anger. Films often portray him as moving in a stately, almost dance like manner, with little more than a stern expression on his face; but Jesus was a carpenter – a general term for a builder in his time. His profession could include things like stone masonry, something which peppers his parables. He was probably no slight wisp of a man. If he flipped a table over, it got flipped, and people got out of dodge. He was mad, okay? Really mad. Jesus wept. When this comes up, I have a friend who always chimes in that she believes He wept because of the unbelief of those around him at the time, that it was a theological weeping. But nothing in the text suggests that, and I always wonder why this must be brought up. It’s not presented as a possibility, but as a correction; almost a needed one. But Jesus wept, really wept. What we are told is that He was in a place among sad people who He loved. He cared. He was there, and He felt. He even knew that He was about to resurrect his friend, the very man over whom the others were crying. But they were still grieving, and they mattered to Him. He was not just there, He was very present. Jesus was present then, and because of the torn veil, He connects with us now personally, not perfunctorily. When we undergo tragedies that we know God already knew was coming, we can easily wonder how He could care. Again, He already knew about it, so it was no surprise. How could he have feelings about it? Well, He cares. If we can connect with and care about fictional characters, how much more can he connect with real people when we are in pain, worried, or delighted? He is God, after all. He is better at things than we are, including caring and feeling. Thank you for reading Redeeming Culture! Come back tomorrow to see Trektember take the stand for The Drumhead. David Lichty is a movie buff and staff writer for Redeeming Culture. You’ve heard his voice in several podcast episodes, and you’ll hear more from him before Trektember is over! He’s also writing the ongoing Trek Backstory miniseries, which explores the behind-the-scenes production parables of TNG.